m Flow, Microsoft’s stealth-mode scripting engine, has arrived on Android, six weeks after seeping onto iOS. The Flow app is similar to conditional workflow tools like IF (formerly IFTTT) and Tasker, which are far more mature. Strangely, consumer Office 365 accounts aren’t supported – you need to have a “work or school” account. This is odd because the supported services are as much consumer or "prosumer" offerings, like Twitter or DropBox - as the snapshot below (from the Google Play store) illustrates. Microsoft also updated its PowerApps engine for Android last week. 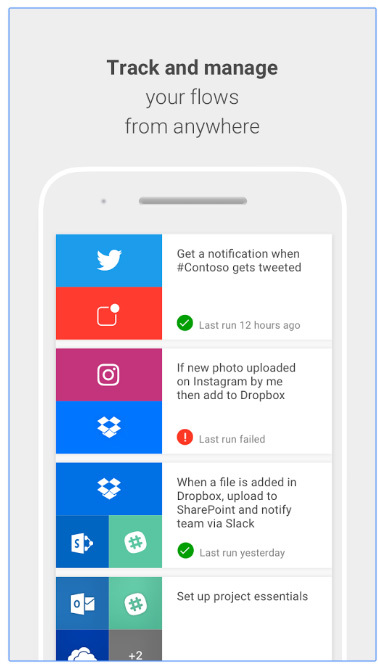 Launched late last year, PowerApps intends to allow LoB (line of business) or End Users to tap into Azure or Sharepoint to create SaaS apps by quickly grabbing some functionality and wrap it into a bundle. The latest PowerApps allows you to create an app from a Modern List in SharePoint. Neither Flow nor PowerApps is yet available for Microsoft’s own mobile platform Windows 10 Mobile yet.